Desktop version: Lite, Professional, Corporate and Enterprise. Server version: Professional, Corporate and Enterprise. Page auto-selection with conditions and sub-cond. Feature list based on Print&Share v2.8.3.67. Subject to changes. The Print&Share Enterprise version contains all features with additional enterprise facilities. 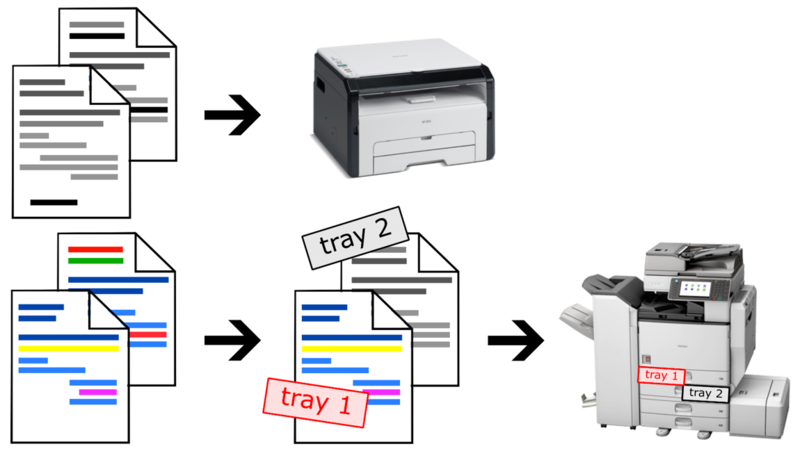 Distribute your print jobs to an available printer based on load balancing parameters. Determines the optimal printer for your print job. Travel around the world and print automatically to your branch office printer. 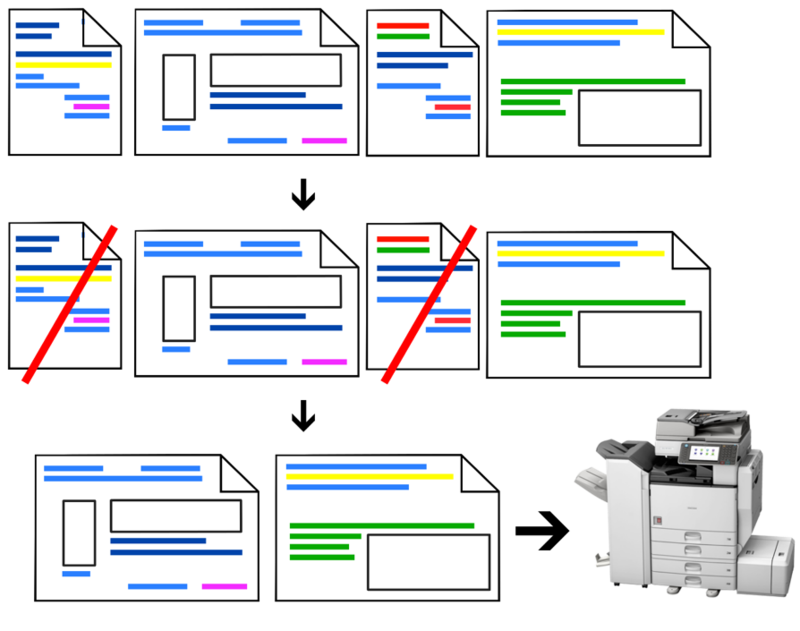 Print one job to multiple printers with a single click. The Wite Space Merging feature allows Print&Share to calculate the white space on the current page and the print coverage on the next page. 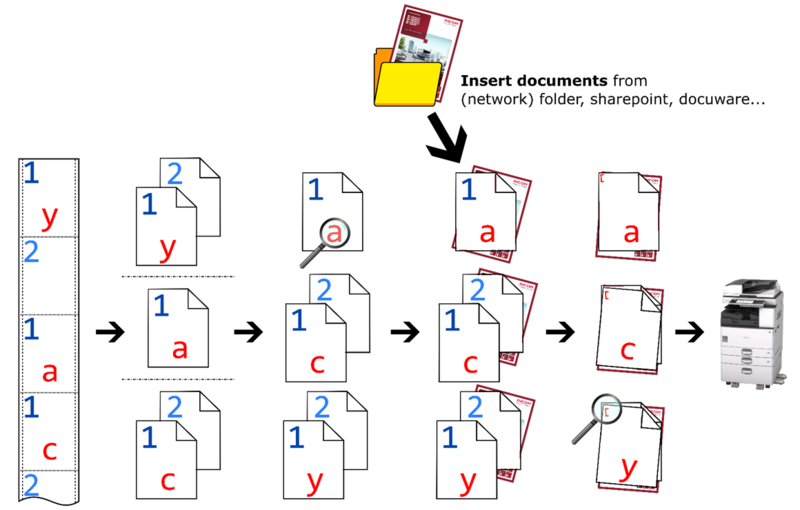 Depending of the result, Print&Share will combine the pages to save paper. 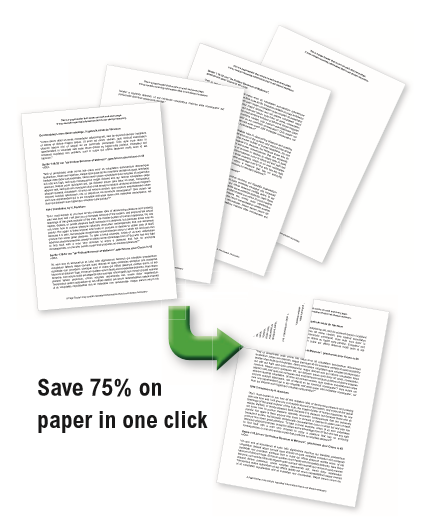 With this Print&Share eco feature you can combine multiple pages onto one sheet of paper. This helps reducing the amount of paper that you use and eliminates paper waste. Hassle-free page selections. Just click a page thumbnail in the visual thumbnail overview to select or deselect a page for printing. This convenient feature makes it child's play to skip redundant pages. Each output channel can be custom designed to have the same look and feel across each output. Insert one or more documents (or pages of a document). The locations can be from a (network) folder, SharePoint, DocuWare,... 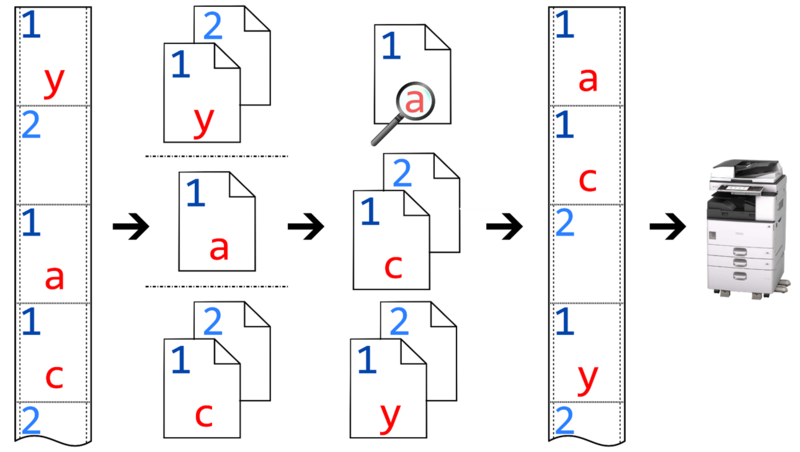 The location path can be dynamicyally composed by recognition based on the document content. 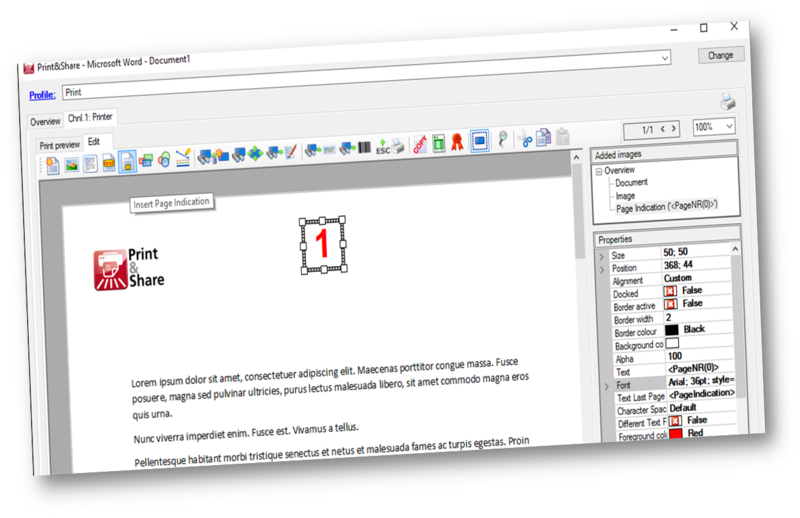 A rich embedded editor in Print&Share gives you the opportunities to create your own page and add it to your document. An example can be the terms and conditions of your company. 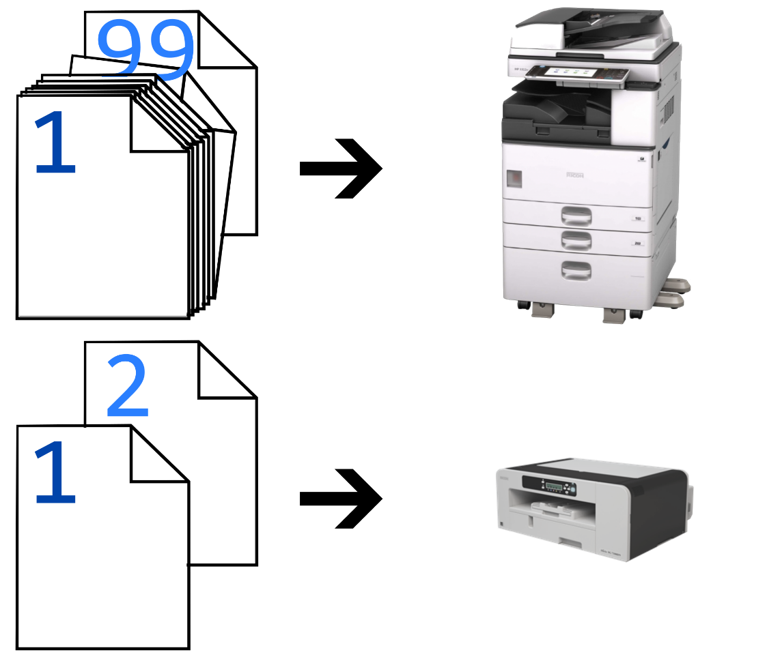 Duplicate or triplicate your original document by copying the orignal page(s) of your print job. Combine the best of software and hardware. Easily duplicate or triplicate your documents and use the finisher of the MFP to staple your documents. 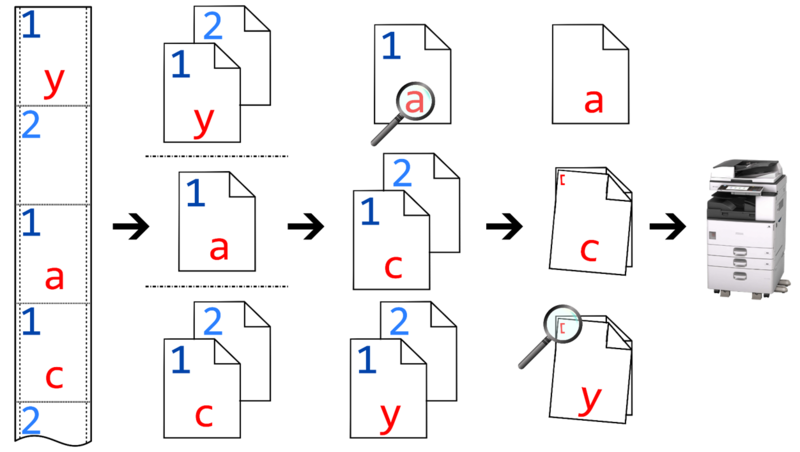 It is possible to only insert documents when a certain condition is matched. This condition can be defined by recognition. 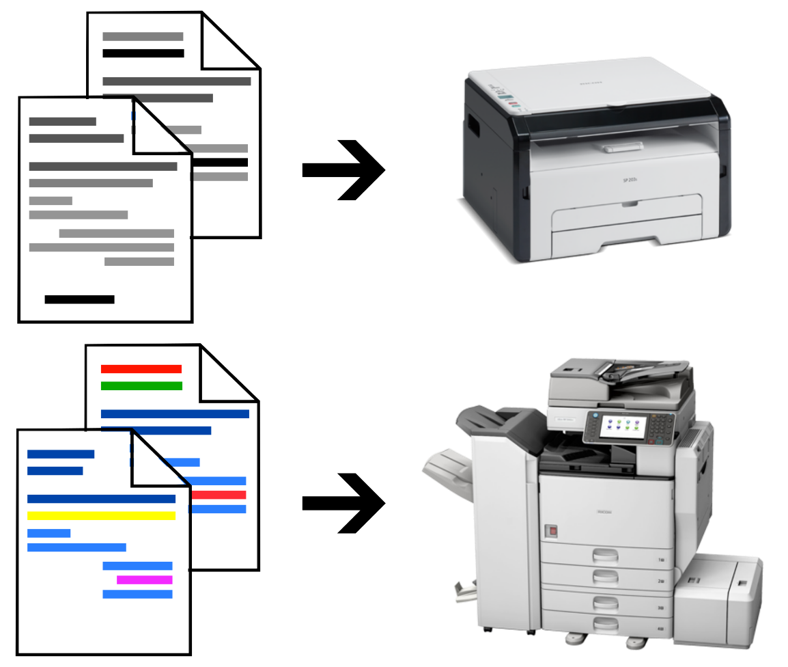 Automatically route large print jobs to a multifunctional device and smaller print jobs to another printer. 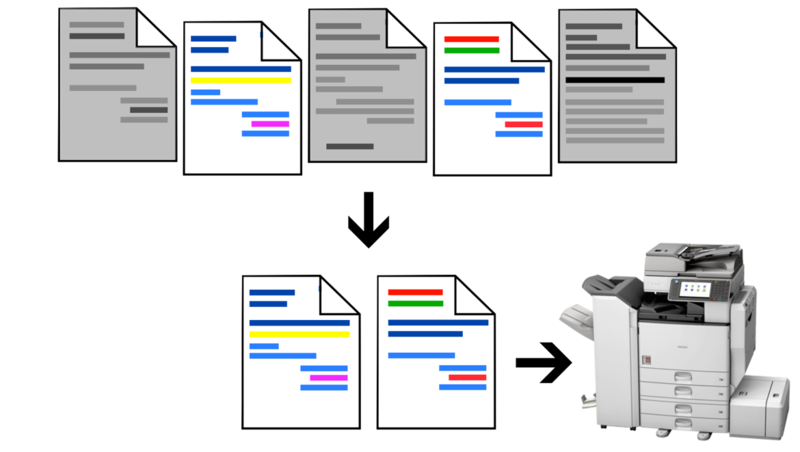 Automatically route colored print jobs to a specific multifunctional device and black/white print jobs to a different printer. 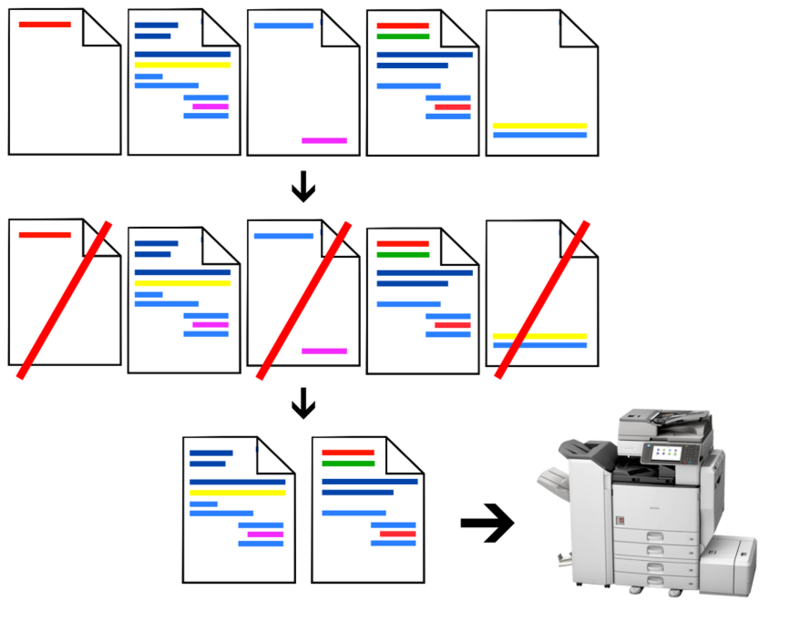 Automatically route black/white print jobs to a printer and colored print jobs to an MFP. For the colored print job, force specific pages to black/white and use a specific tray based on the color. For example: only select and print pages that contain color. Ignore pages that contain too much white space (or based on % or cm coverage). Configure once and apply automatically. Select only pages in A3 landscape. 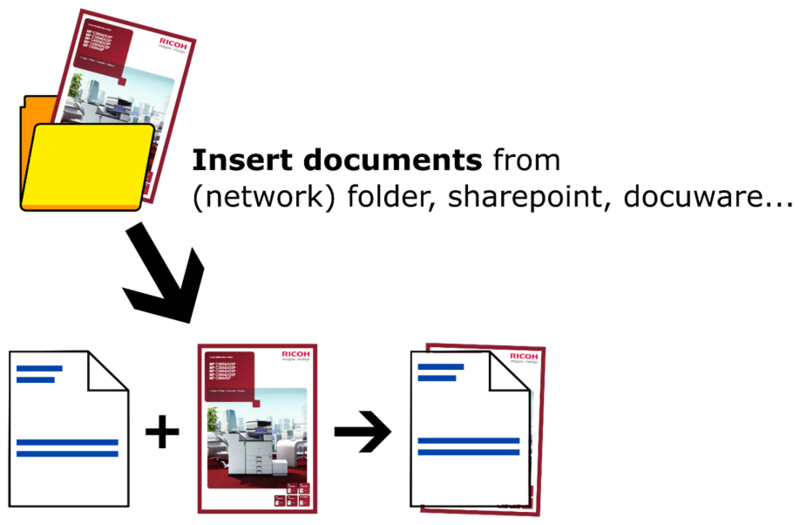 Create a page routing workflow and select the device that best fits your print job. Send black/white and colored pages to a specific tray. 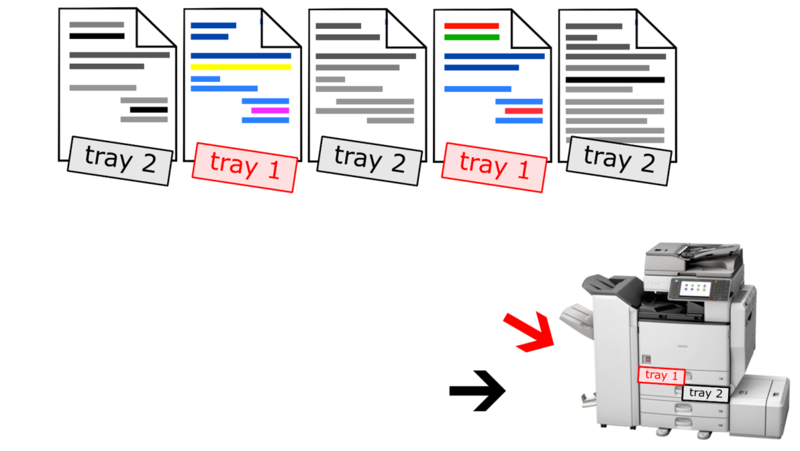 Use and combine all the paper trays of your MFP/MPC. 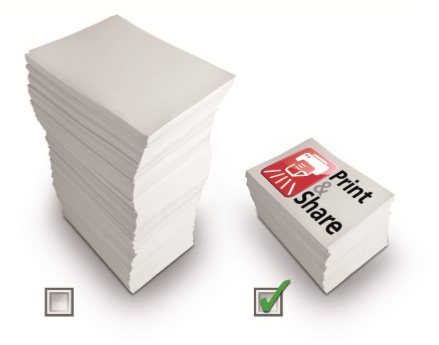 Split your print jobs with Print&Share and send them as separate jobs to your MFP. Split a large sprint job (spool), sort the pages based on the content of the document and send them out as individual jobs to be stapled. 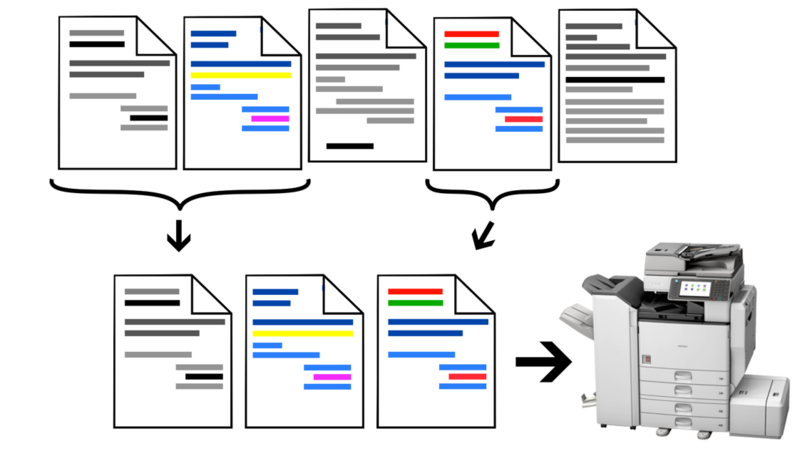 Split a large print job, sort the pages based on the content of the document and recombine them again as one big print spool. 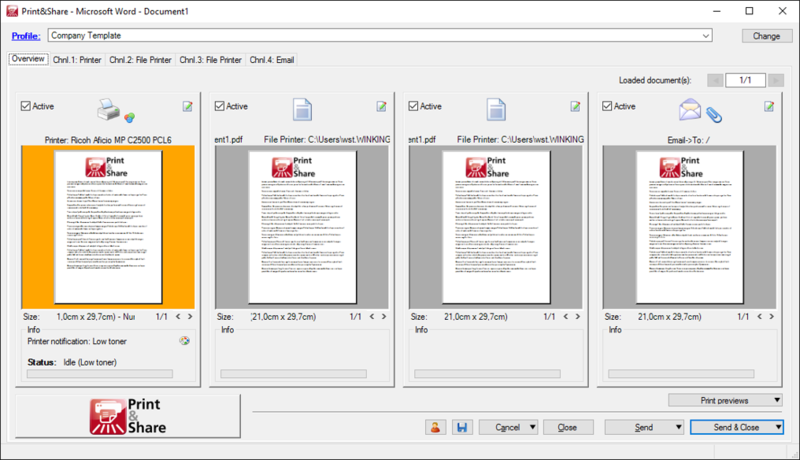 Now combine the insert documents feature of Print&Share with the previous features. 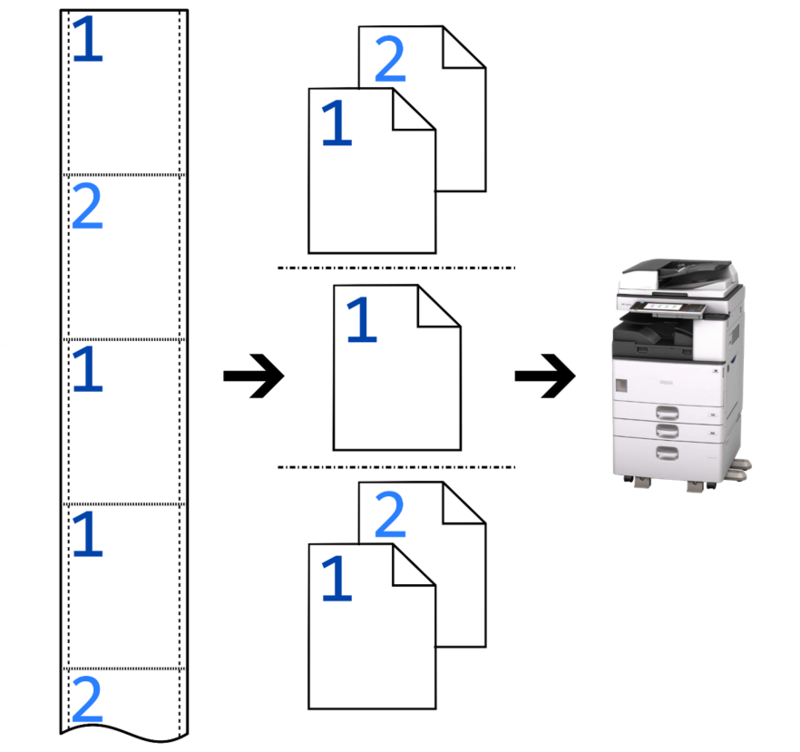 It is easy to split a print job, sort it based on its content, insert external documents from a (network) folder, SharePoint, DocuWare or other DMS and send them out as individual jobs to your finisher to staple. Split specific pages in a print job to different page sizes. 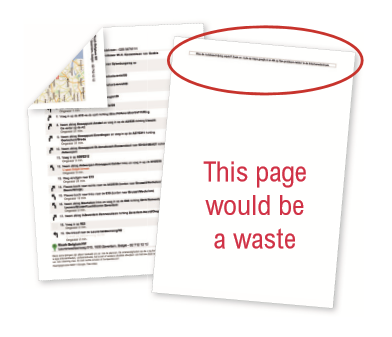 In this example: every A3 landscape page is split into 1x A4, 2x A5. Every A3 portrait page is split into 2x A4. Other pages stay untouched. Add logo's, overlays, barcodes, QR-codes, badges, watermarks,... The Get More Editor provides many tools to enhance and customize your documents. Add page numbers, role numbers, leaf numbers... Renumber existing pages of a document or add page numbers to scanned documents. Archive your documents or customized version of your document with one click to one or multiple destinations. 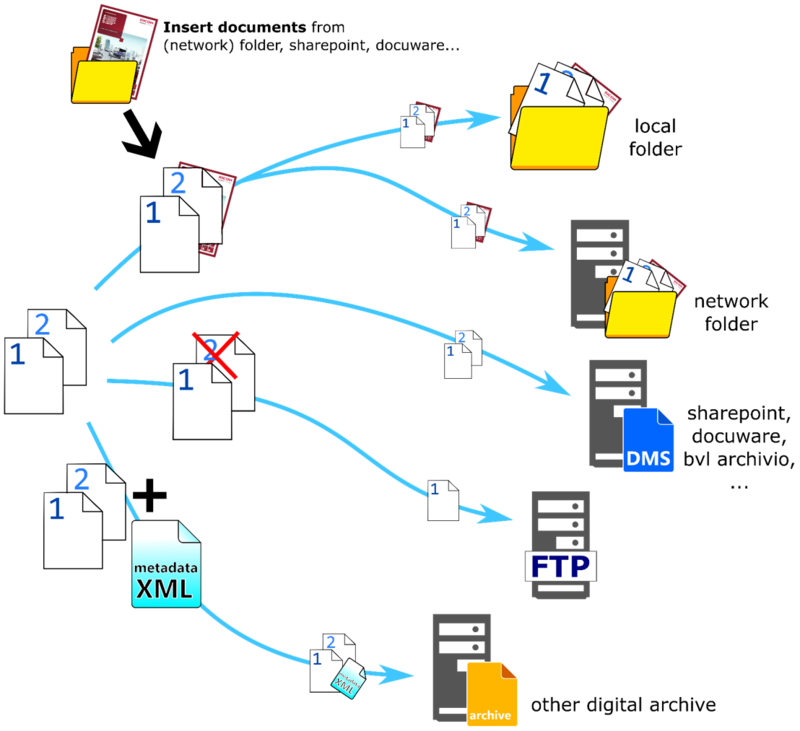 This could be a local folder, network folder, DMS like SharePoint, DocuWare, BVL Archivio, and FTP server or other digital archive. Not only archiving but also retrieving documents from these locations is possible.